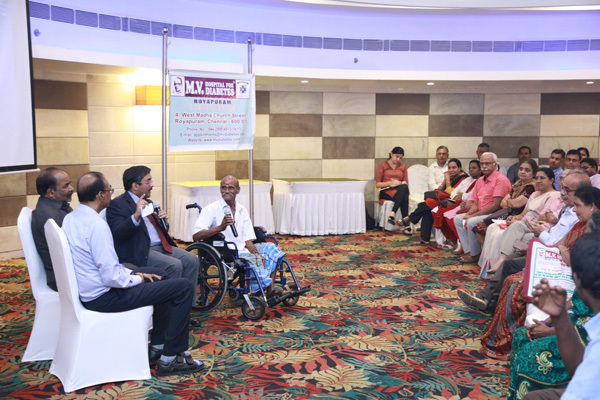 A PUBLIC LECTURE ON ‘HOW TO PREVENT AMPUTATION DUE TO DIABETES’ BY Dr.VIJAY VISWANATHAN, HEAD & CHIEF DIABETOLOGIST, M.V.HOSPITAL FOR DIABETES, ROYAPURAM ON 09-12-2017. 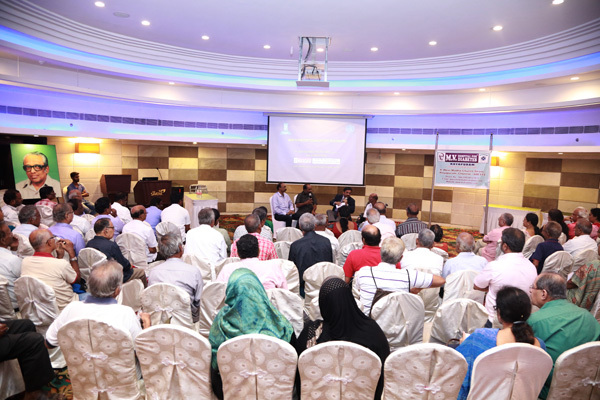 Photo above, a public lecture for prevention of amputation and an interaction with patients who have already undergone amputation and share their life after amputation. Photo below, a free foot examination is being conducted. 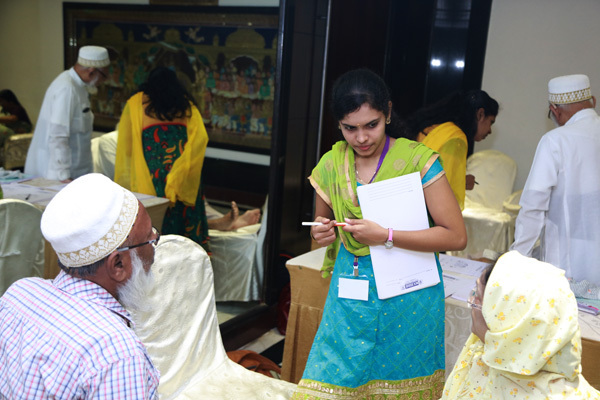 The MV Hospital for Diabetes and Prof M Viswanathan Diabetes Research Centre Royapuram Chennai was given the honour of being the IDF Centre of Education and IDF Centre of Excellence in Diabetes Care by the IDF International Diabetes Federation Belgium. 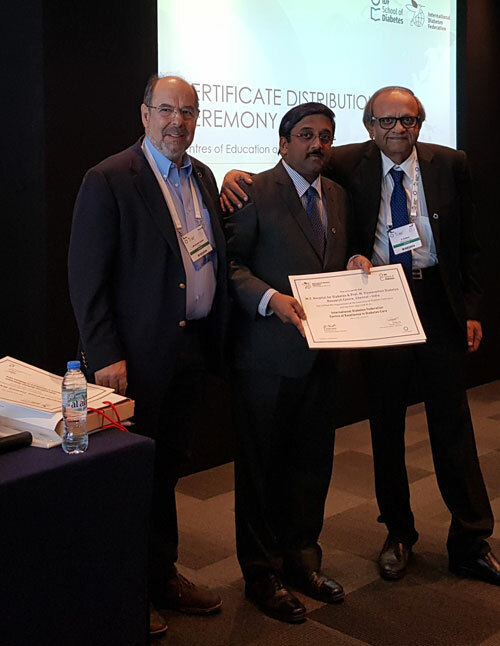 Dr Vijay Viswanathan Head and Chief Diabetologist receiving the certificate from Dr Sadikot, President IDF during the World Congress at Abu Dhabi on December 5, 2017. 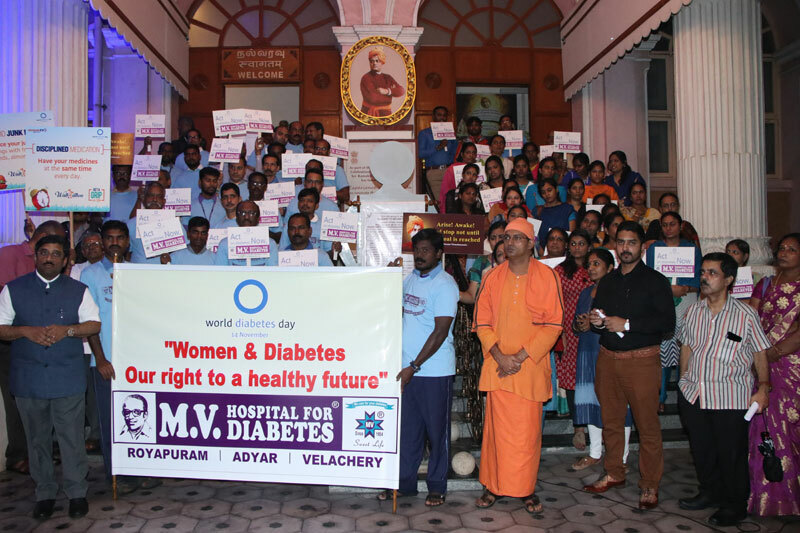 WORLD DIABETES DAY RALLY AND BLUE LIGHTING ORGANIZED BY M.V.HOSPITAL FOR DIABETES ROYAPURAM ON 13-11-2017 & 14-11-2017. 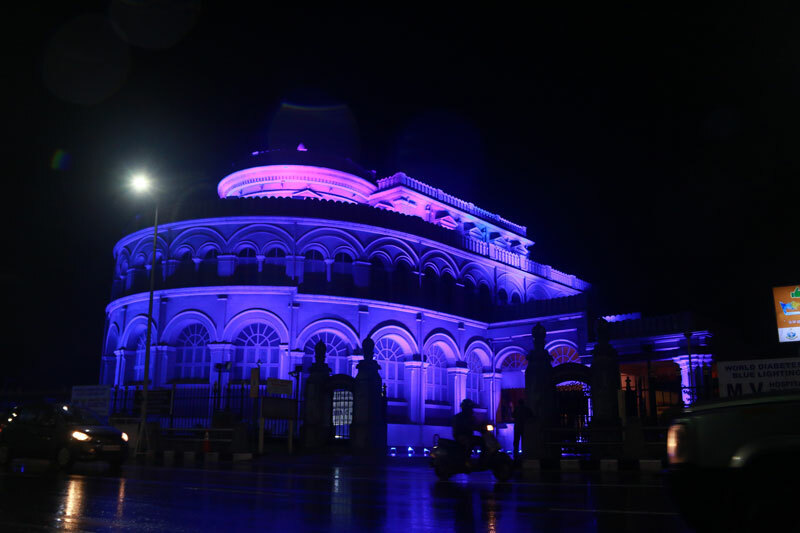 Photo[left] a rally led by Dr. Vijay Viswanathan, Head & Chief Diabetologist and Swami Dakshananda, senior monk and in charge of the 175 years old Swami Vivekananda House on Marina Beach and Photo[right] Swami Vivekananda House is decked up with blue on the eve of World Diabetes Day. CELEBRATING 71ST INDEPENDENCE DAY AND THE LAUNCH OF PHASE-II CHENNAI POLICE DIABETES PROJECT AT A FUNCTION ORGANIZED BY M.V.HOSPITAL FOR DIABETES AND PROF. M. VISWANATHAN DIABETES RESEARCH CENTRE ROYAPURAM ON 15TH AUGUST, 2017. 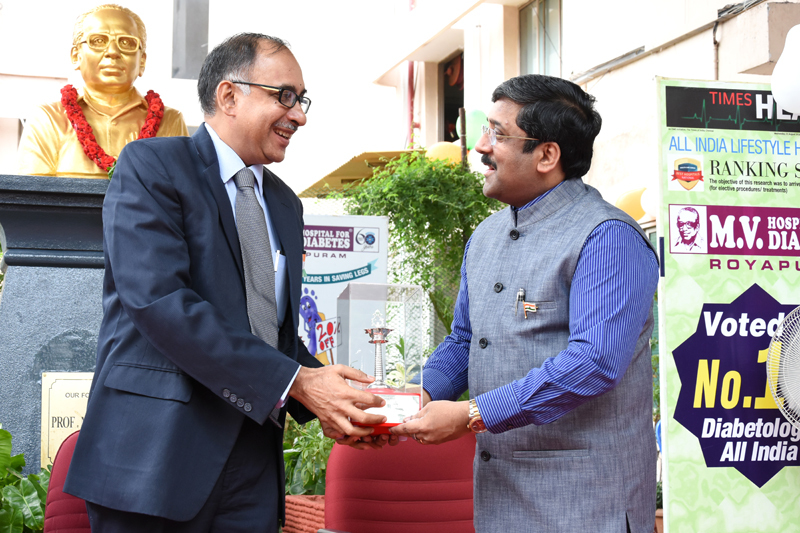 [Photo left] Hon’ble Thiru. 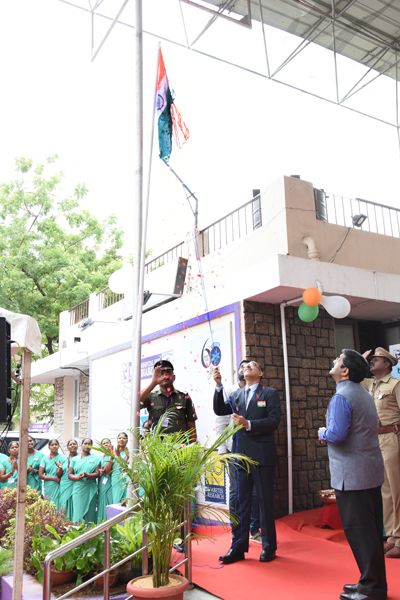 Justice C.V.Karthikeyan, Judge, Madras High Court hoisting the National Flag on the occasion of 71st Independence Day and [photo right] the Judge is being presented with a memento by Dr.Vijay Viswanathan, Head & Chief Diabetologist of the Institute.